Of pumpkins and parsnips and walnut tree chips. The vexed and troubled English colonists in seventeenth-century Maryland drank any crop that could be steeped, mashed, fermented, and distilled. They didn’t say no to corn, barley, pine bark, apple skins, cherries, plums, persimmons, or sassafras roots. When the Ark and the Dove set out for Maryland’s shores, stowed below were 4,158 gallons of wine and beer “for the use of the right honorable Lord Baltimore and other gentlemen.”1 Lord Baltimore never visited his New World real estate, and that left more booze for the gentlemen who did. Speaking of booze—in the fourteenth century, the English borrowed the Dutch word bouse, which means to swill, guzzle, tope, and tipple. It also means to drink for enjoyment or good fellowship. That second definition describes most of the social clubs in Annapolis in the early 1700s, but particularly the Tuesday Club. Thirty-three-year-old Scottish physician Alexander Hamilton started the Tuesday Club in 1745. Dr. Hamilton’s face, by the way, does not grace the sawbuck in your wallet, nor was his monthly gathering of gentlemen the only one dedicated to toping. The Ancient South River Club, the Royalist Club, the Redhouse Club, and the Ugly Club preceded it, but the Tuesday Club is the most famous. That’s because Dr. Hamilton, alias Loquacious Scribble, wrote a satirical history about it. 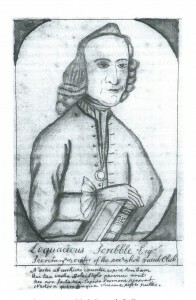 His manuscript of 1,900 pages plus illustrations is still available as Records of the Tuesday Club of Annapolis: 1745-56. Vexed and troubled Englishmen, indeed. 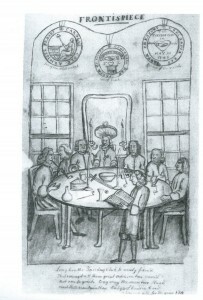 After Dr. Hamilton visited New York’s Hungarian Club he wrote, “Two or three toapers (sic) in the company seemed to be of the opinion that a man could not have a more sociable quality . 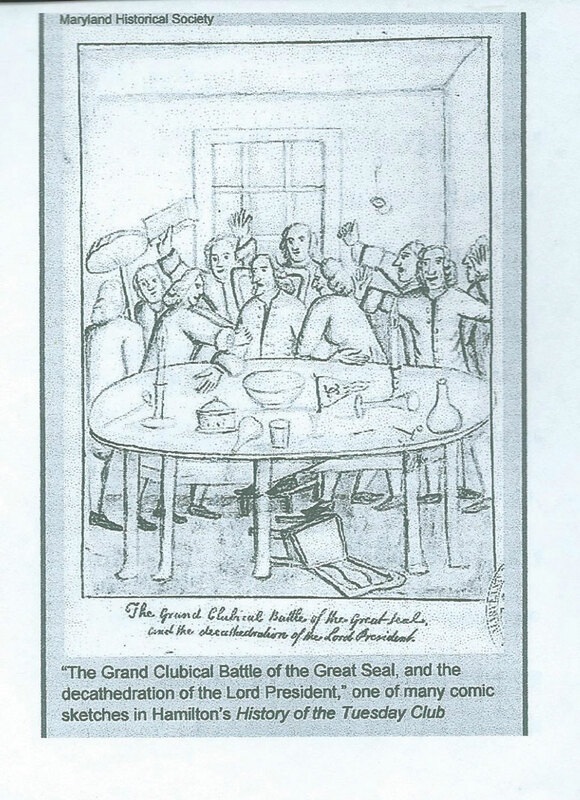 . . than to be able to pour down seas of liquor, and remain unconquered, while others sank under the table.” Under Hamilton’s leadership, however, the Tuesday Club flourished. It limited official membership to fifteen, but welcomed guests and honorary members. Benjamin Franklin, dubbed Electro Vitrifico, visited the club in January 1754. Annapolis bustled as a center of commerce and culture, and the Tuesday Club’s roster listed some of the best-educated and most creative minds in town. Samuel Middleton, original owner of Middleton Tavern, belonged. So did Jonas Green, publisher of the Maryland Gazette, the pastor of St. Anne’s church, a lawyer, a judge, the Secretary for Indian Affairs, and several government officials. The men called their meetings Sederunts, Latin for they sit. Each member received an alias—Jealous Spyplot, Prim Timorous, Philo Dogmaticus, Merry Makefun, and Crinkum Crankum, among others. They gathered every Tuesday evening, most often at Dr. Hamilton’s home on King George Street, and sometimes at Middleton Tavern. The Tuesday Club exemplified the Age of Enlightenment’s enthusiasm for literature, music, theater, and philosophy. Dr. Hamilton and his colleagues added drinking, humor, and tomfoolery. The weekly program began with a candlelit dinner, a punch bowl making the rounds, and toasts to the king and then to the ladies. Some of those toasts were off-color, as when someone commented on how easy it was to find a word to rhyme with Miss Hunt. As Hamilton put it, “We converse, Laugh, talk, Smoke, drink, differ, agree, Philosophize, Harangue, pun, Sing, Dance, and fiddle together.” (sic) Members composed some of the earliest known secular music in America, and performed on fiddle, flute, cello, viola, and harpsichord. 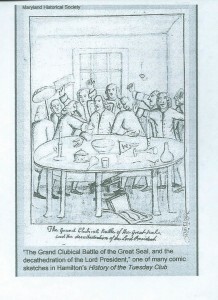 To allay the province’s bitter partisan disputes, the club’s “gelastic law” required everyone to burst into laughter at mention of Maryland politics. Members read their humorous or satirical poems and essays, and discussed philosophy and literature. Hamilton and Green composed punning riddles, called conundrums, and challenged members to solve them. Some of them bordered on bawdy: “Why is a wanton lass like a book just published? Because she is in sheets and wants stitching.” (Stitch was an eighteenth-century term for lying with a woman). The conundrums were such groaners that some members demanded they be abolished as a “[s]pecies of low wit altogether unworthy of the dignity of the Club.” The factious group was led by William Cummings, aka Jealous Spyplot. Hamilton and Green claimed that Spyplot was miffed because he couldn’t guess the answers and had to forfeit all the games, but the conundrums were finally eliminated. Error: Error validating access token: Session has expired on Saturday, 09-Mar-19 15:57:50 PST. The current time is Tuesday, 23-Apr-19 08:56:49 PDT.